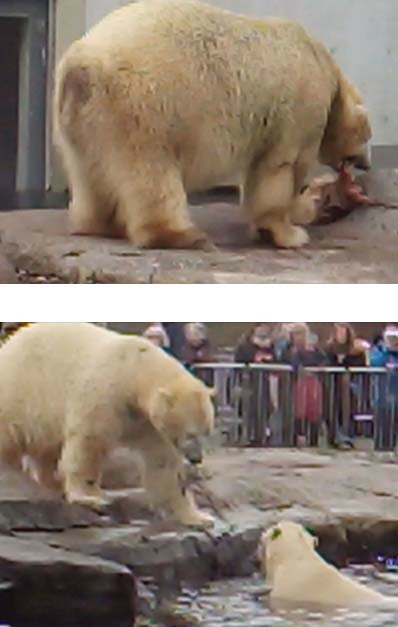 On Saturday 16 March, my last day in Copenhagen Zoo, I was able to see Lynn nurse her daughter. 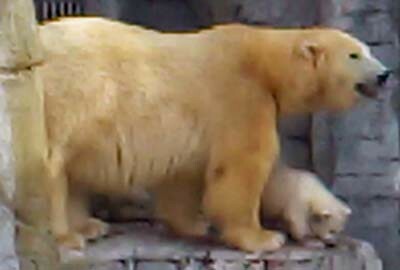 Lynn and Baby emerge on to the enclosure. 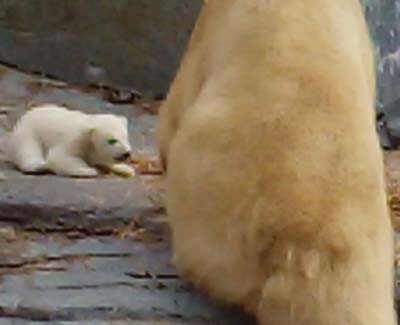 Baby stops to check something interesting while Lynn checks out the crowd of visitors. 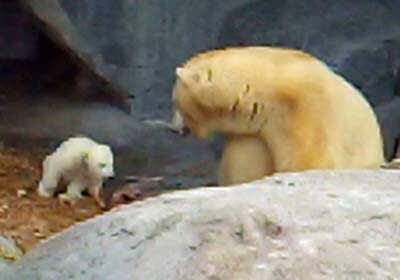 Baby decides to tell Lynn that she is feeling hungry and thirsty. 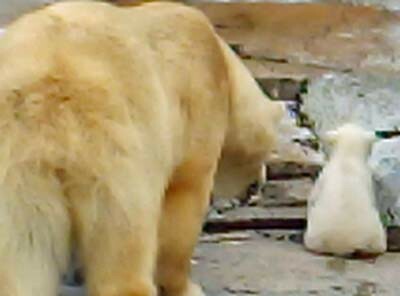 Lynn tells Baby that she is ready for the milk bar to open. Baby locks on for her favourite part of the day. Lynn waits patiently while her daughter enjoys high protein milk from Mum. Nearly done. The famous “suckling” noise could be heard as the crowd kept very quiet. Baby is happy and contented and seems to be settling down for a nap. But there are too many interesting smells to investigate! Lynn looks pleased and proud of her daughter. 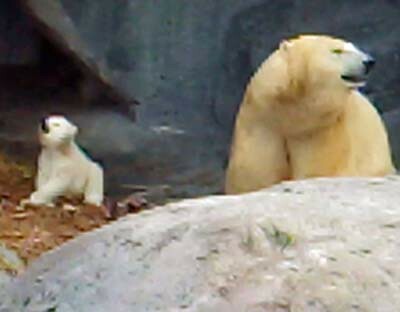 Mother and Baby are doing fine! 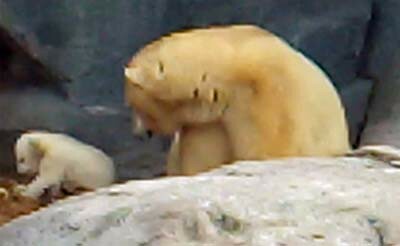 Lynn has a calming influence, and not just on her cub! I really enjoyed the two days I spent with her. 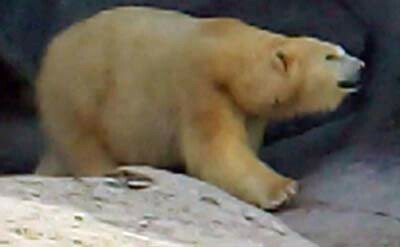 Lynn is a lovely large confident Polar Bear. No wonder Baby feels so safe. 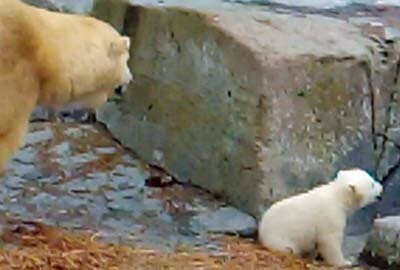 Patience is important for Polar Bears young and old! Baby needs a bit of encouragement to come on down! 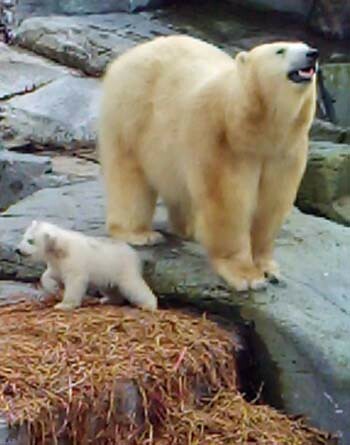 That’s better, Mum and Daughter are the stars of the Zoo! 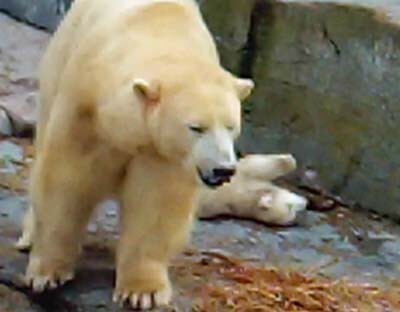 Baby has discovered the favourite Polar Bear position, paws in the air! 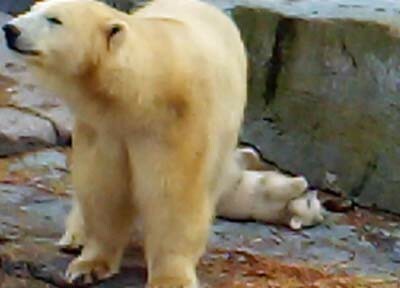 Baby has a good roll, but Lynn is keen to move on. 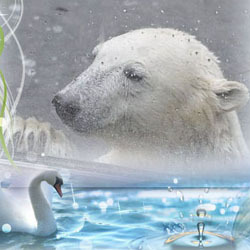 Scents are the most important part of a Polar Bear’s world. Mum and Baby check them out. Baby needs frequent rests and Lynn is happy to let her. The rests do not last long. The smell are too exciting! But another rest is perhaps a good idea. Lynn watches over Baby. 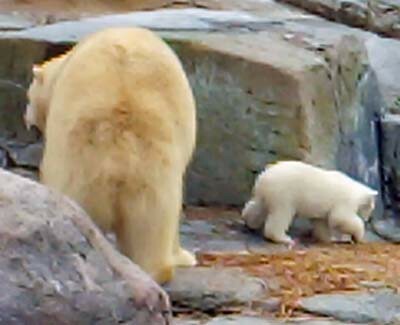 Mother and Daughter with a large place to investigate. After five days in Denmark it was all too soon that I had to think about getting back home. But before I go, there are still some more images to share. 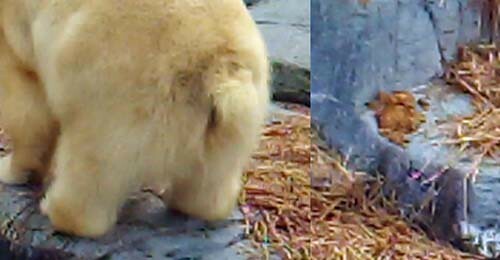 There is now water for Lynn and Baby, but the covering of straw kept the little one safe and occupied and provided somewhere soft to lie. 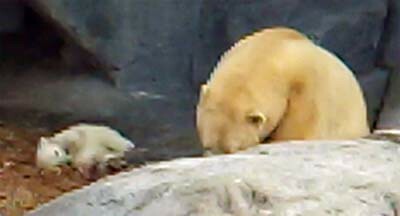 The rocky enclosure seems to keep both Lynn and Baby occupied. Lynn gave me a farewell present by standing up to see the crowd. 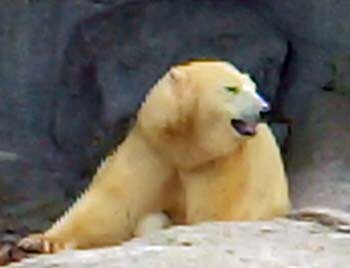 She is a beautiful Polar Bear. 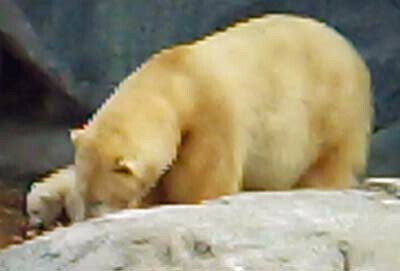 Something for the school books, Polar Bear “Hinterlassenschaften” is normally dark because of the meat diet. Lynn has been eating a lot of fruit and vegetables. Lynn is as fascinated by the branch in the rock as her daughter. Another shot of Lynn showing her beautiful fur, and the powerful muscles underneath. Lynn walking at speed to keep an eye on Baby. Sadly, it was time for all of us to say goodbye. 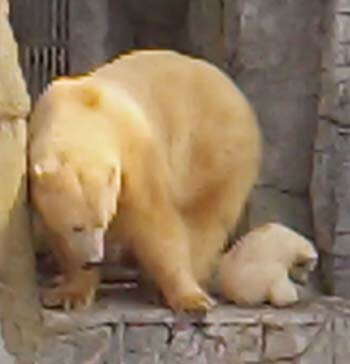 Baby started to go inside. 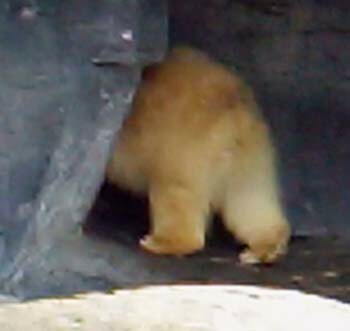 She made her way towards to doorway. 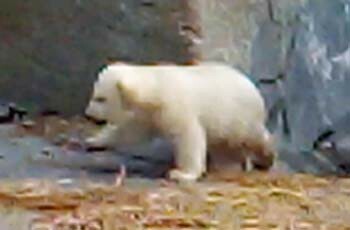 A final glimpse of the Copenhagen Cub. Next time I see her, she will be much larger! Baby and Lynn go in for a rest and I make my way to the exit (stopping of course to buy some cuddly bears in the excellent Zoo Shop). 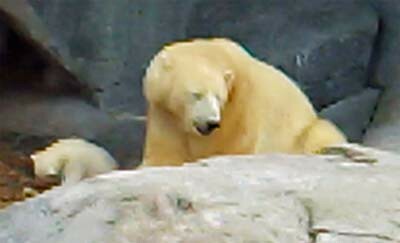 I was able to say goodbye to Inge from Copenhagen as well and also to two other Polar Bears. 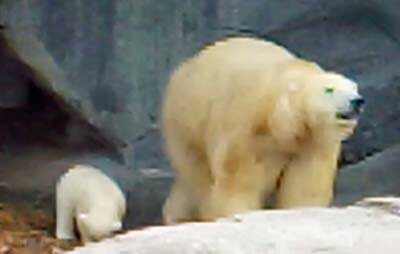 Nord and Noel may not be as cute as Lynn and Baby but they are an impressive couple and always entertain the visitors, even when they are not underwater. 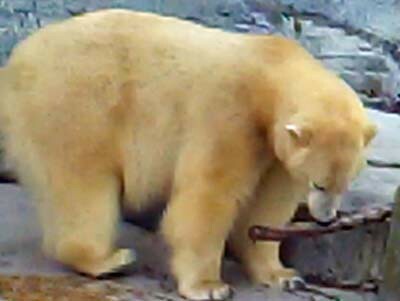 I am so pleased that Inge will be able to keep us posted as to how all the bears in Copenhagen are getting on. 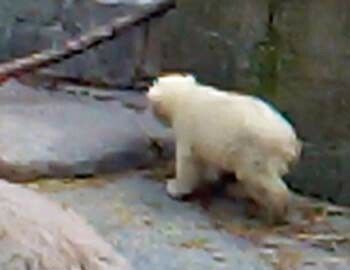 Dear RALPH – I can very well imagine it was hard to say Bye-Bye to all the lovelies in COPENHAGEN (tiny cute cub, Mamma LYNN, friend INGE, NOEL and NORD . . .). Thank you very much for having brought another interesting pictured report from them all (sauf INGE). BTW: Do you or somebody else know somehing about dear how and where EVI (biggest friend of LYNN!!) is? Even during your last day in Copenhagen you could witness lots of lovely scenes with Lynn and her daughter – and also with Nöel and Nord. 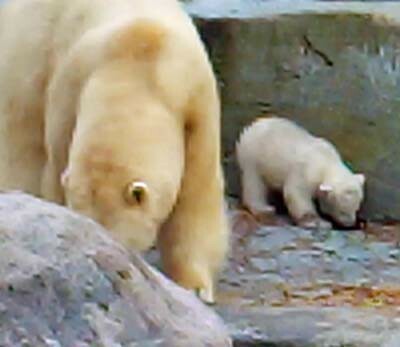 It’s really fantastic to see how a polar bear mama teaches her baby the ‘polar bear things’ – step by step. Lynn instinctively knows how to do it. I’m lifting my hat to the first time mama! Thank you so much for the series of reports from Copenhagen. They are all very informative and entertaining! Thanks for another delightful report! Next best thing to being there! Thanks! das ist wieder ein ganz reizender Bericht. Du hattest eine besondere Zeit diesmal in Dänemark. Deine Fotos sind tolle Mitbringsel. Schön, dass Du sie mit uns teilst. 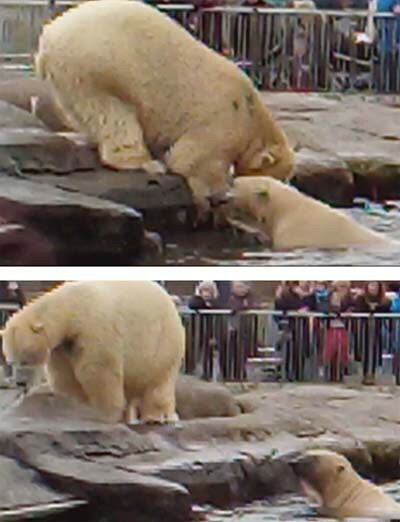 Sehr gut, dass man die vielen Steine mit weichem Heu/Stroh abgepolstert hat, damit sich das Kleine nicht weh tut. Leben Dank für den schönen Bericht, der mir viel Freude bereitet hat. Liebe Mervi, für das Editieren von Ralphs schöner Reiseberichs-Serie ganz herzlichen Dank! thank you for the interesting report from Copenhagen. 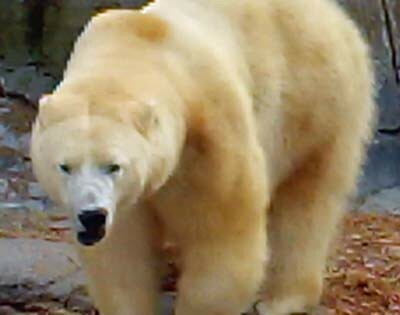 danke auch für den zweiten Teil von Deinem Besuch bei den Eisbären in Copenhagen. Das Kind scheint sehr neugierig zu sein. 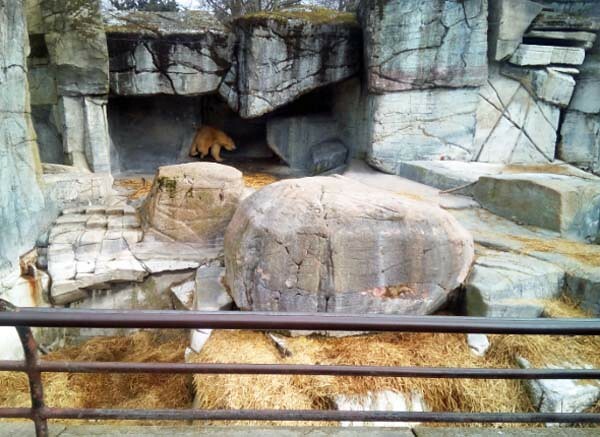 Thank you for the pics and your detailed descriptions of your last day in Copenhagen! Lynn and her little daughter did everything to make it hard for you to leave them behind. Lynn gave you a wonderful fare well gift when she stood up so you had the possibility to take a beautiful photo of her. 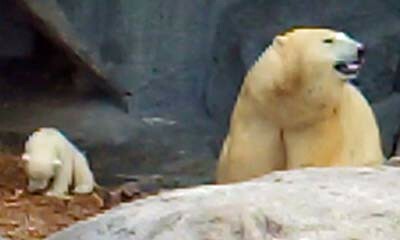 I don´t really like that steep and stony mother-child enclosure. 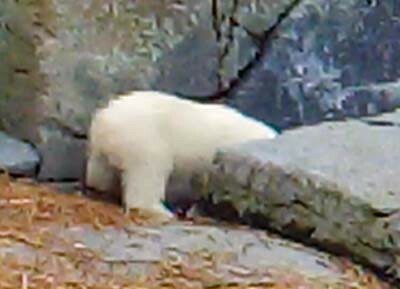 I wonder if the straw would help if the cub slips and falls. But I might be worried unnecessarily. 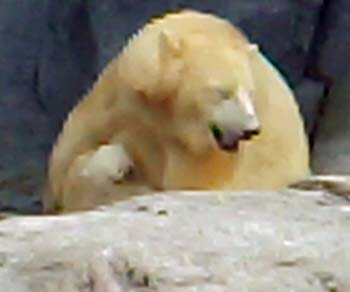 I wish all four polar bears in the Copenhagen Zoo all the best! Kind regards to Inge who will hopefully keep us updated. Log in | 55 queries. 0.800 seconds.